In VGS site, we have connected all our website forms and our vtiger extensions store to Vtiger CRM. When we get a new enquiry, request or order, all the information is stored in the CRM without any manual entry. The company website is a field which we use a lot but rarely ask it from our customer.It’s a critical part of our lead scoring process. To avoid having to enter manually this information, we create a vtiger module that uses the last part of the person emails to guess and update their website field. 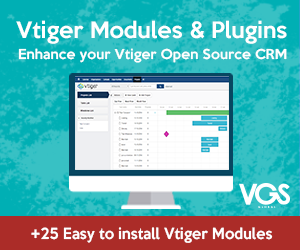 The module is one of VGS Global contributions to vtiger community. You can freely download and use it.